The facelift or rhytidectomy has been in surgical practice for more than 100 years, with the first documented facelift performed in 1901. 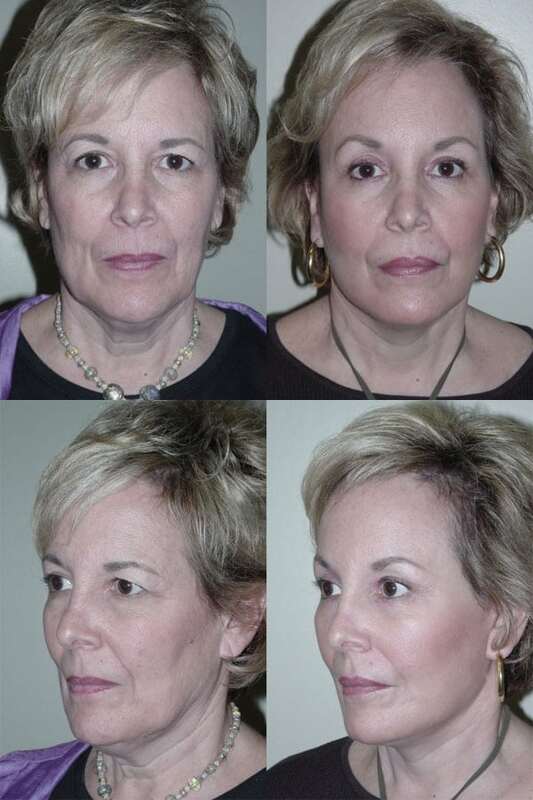 Since then, many different approaches and techniques have been developed that can be applied to the specific needs of each facelift patient. Many facelift procedures are done in conjunction with other surgical procedures, such as eyelid surgery or a brow lift, to create even better results for the patient. A facelift is an appropriate procedure for both men and women hoping to dramatically turn back time on their appearance. The procedure removes excess skin and repositions tissue to produce a smoother, firmer look with a noticeable reduction in facial wrinkles. Patients should be healthy and non-smokers, with a positive, realistic outlook for their procedure. It is also essential that patients follow pre- and post-operative instructions very carefully to ensure the safest surgery and the best results. In some cases, a facelift alone can produce superior results. However, Dr. Batra often recommends a facelift in combination with other procedures like eyelid surgery, a neck lift or a brow lift to achieve even more dramatic results with a single surgical procedure. 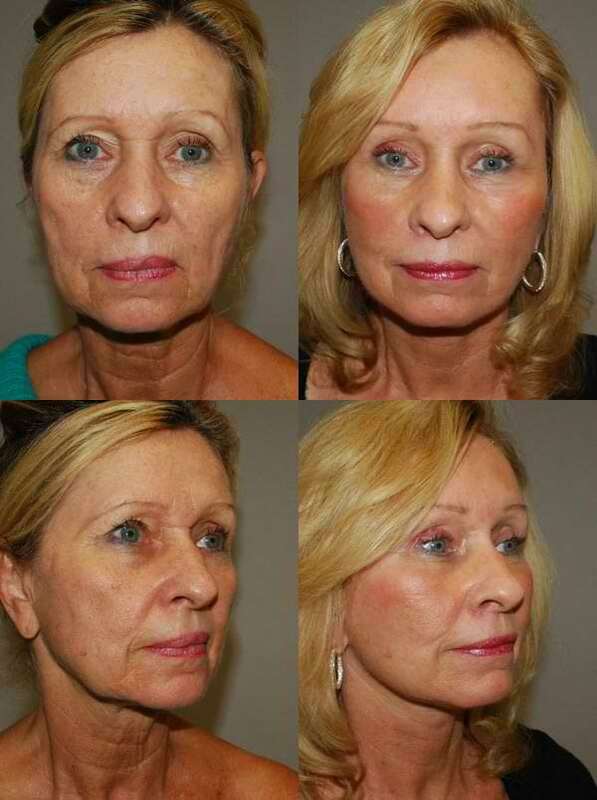 Our facelift patients normally undergo their procedure under general anesthesia. In cases where not as much correction is required, you may receive local anesthesia or a light general anesthetic. Depending on the unique aesthetic needs of each patient, a certain amount of facial skin might be removed and the underlying muscle tissues might be reshaped. Muscle tissue may be tightened together with the skin or they can be tightened separately. After the facelift surgery is completed, the skin is gently re-draped and sutured back in place, using tiny stitches that will not leave much visible scarring. Drainage tubes may be left in the incisions after the procedure to promote drainage and minimize swelling after surgery. All of these decisions will be discussed with you at your initial consultation, so you know exactly what to expect from your procedure. After a facelift, you can expect a degree of bruising and swelling. We will send you home with a prescription for oral pain medication to manage any post-operative discomfort in the first few days after your procedure. We will also give you specific instructions on how to minimize swelling and care for your incisions to minimize scarring. It is imperative that you follow those instructions carefully and allow yourself plenty of time for your recovery if you want to see the best results in the long run. Patients are usually up and around within about one week after a facelift, but they may still have too much bruising and swelling to be comfortable heading out in public right away. Most are ready to make their grand post-facelift appearance within about two weeks. 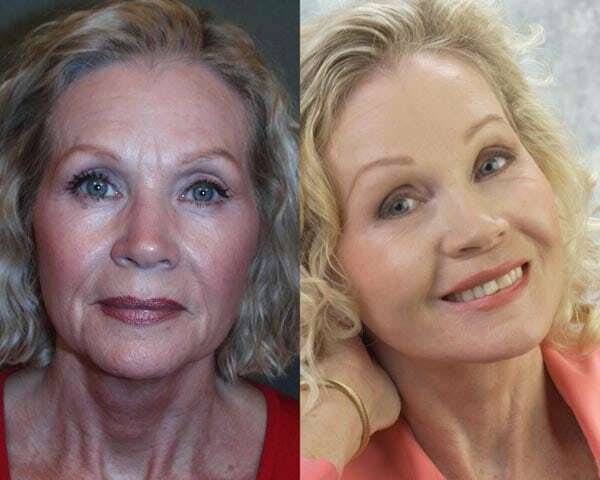 The results of a facelift are long-lasting and most patients will enjoy their more youthful appearance for nearly a decade before requiring any touch-up surgical procedures. A successful facelift begins with the selection of an experienced surgeon to perform the procedure. At our state-of-the-art cosmetic surgery facility, Dr. Batra offers an extensive array of cutting-edge facial rejuvenation and beautification procedures. Over the years, he has treated numerous facelift, eyelid surgery, otoplasty, brow lift and neck lift patients in the Temecula/Murrieta area. 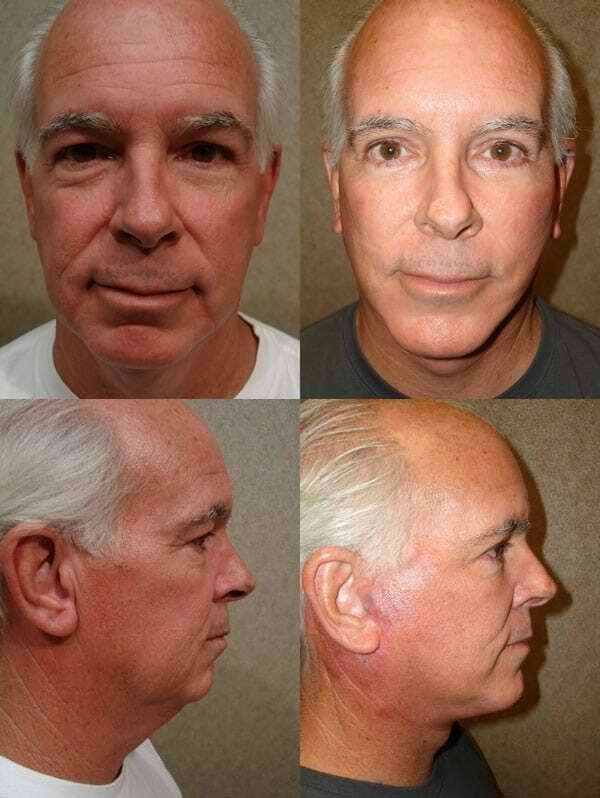 He is renowned throughout Southern California for his expertise in facial surgical procedures. 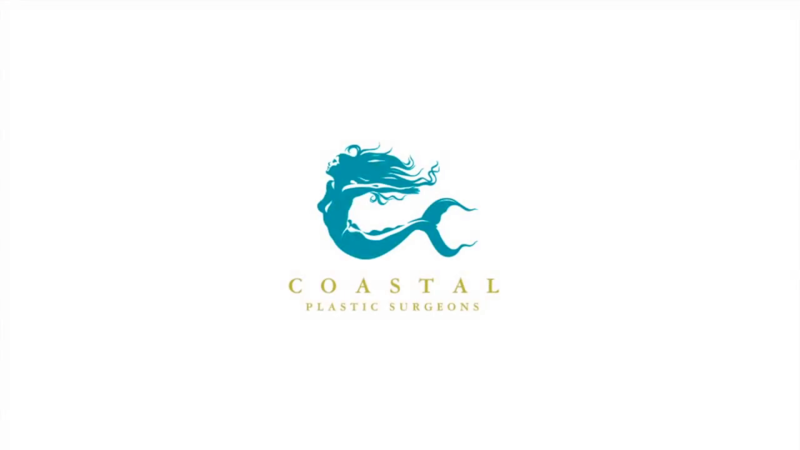 To learn more, contact Coastal Plastic Surgeons at (858) 365-3558. 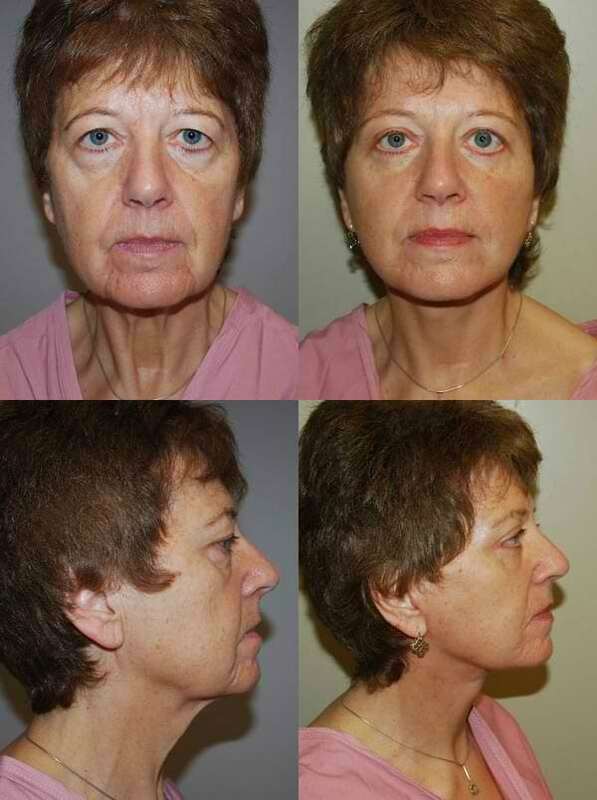 This is a 57-year-old patient who felt that she appeared older than her true age. 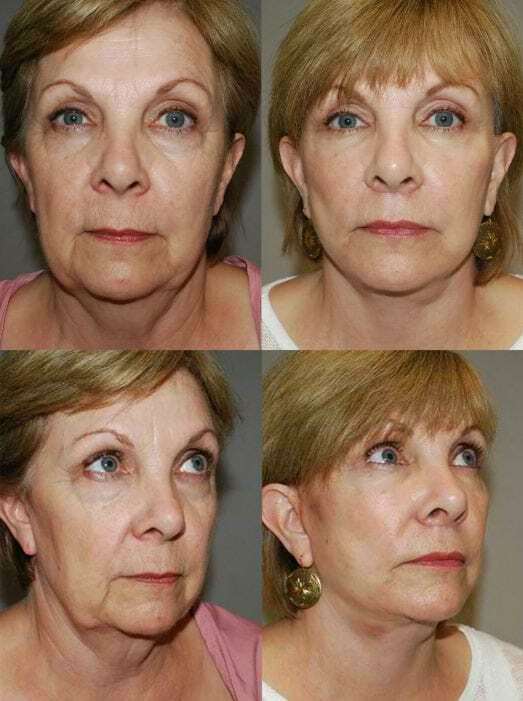 She shows all of the typical signs of facial aging, including lowered eyebrows, extra skin over the upper eyelids, the puffiness of her lower lids, as well as laxity in the jowls and neck areas. Her post-operative photograph was taken approximately eight months following surgery. You can see that it looks as if the patient has decreased approximately 15 years off her age. She has a very nice jaw and neckline. Her eyes also appear more open and the extra skin over her upper eyelids has been removed. There is now no puffiness of the lower lids. In addition, the area in between her eyebrows, which is very deep, has softened, because during the endoscopic brow lift, I was able to cut and remove approximately 75% of those muscles. 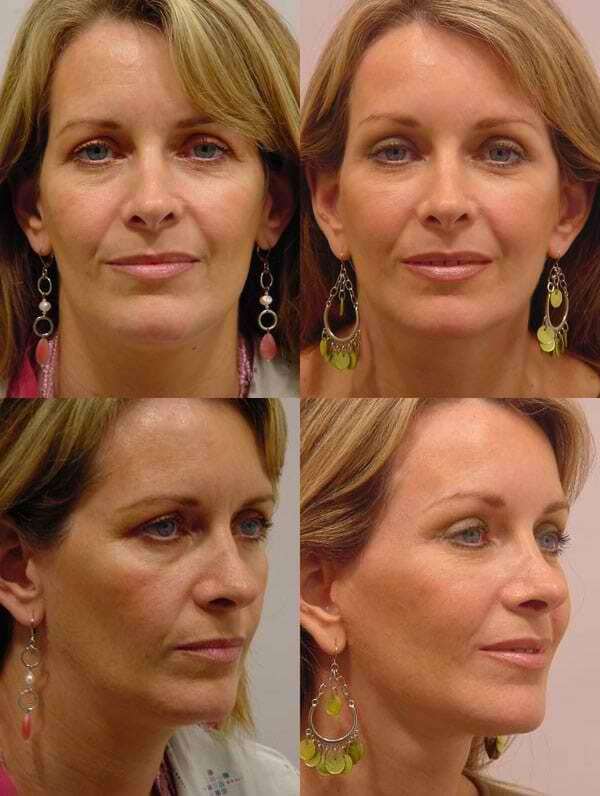 This patient has strong cheekbones and there is noticeable aging in the lower section of her face. She underwent a facelift and neck lift. As you can see in the post-operative photograph, she has a nice and natural look. She does not look over-pulled or over-tightened. She is very happy with her outcome. This patient is in her late 40’s. 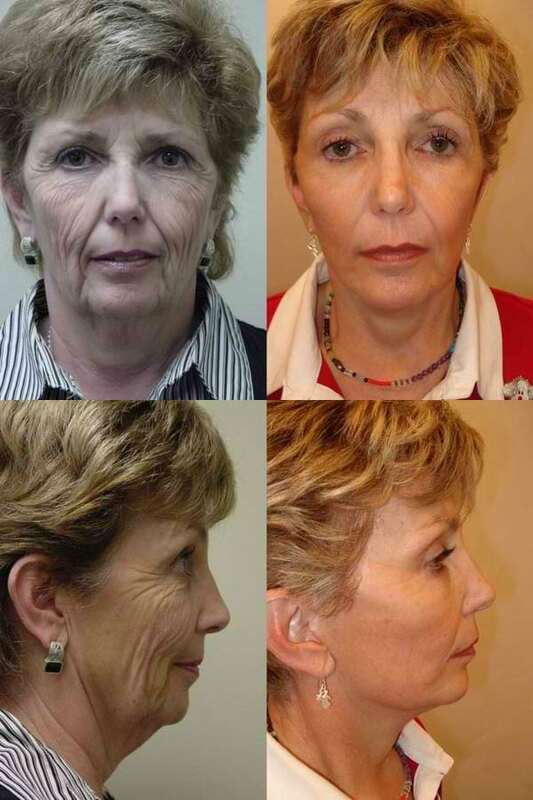 She felt that the lower part of her face was aging rapidly and desired more fullness in her cheeks. She underwent a facelift and neck lift. As you can see, she now has a very nice jaw and neckline, and her face appears more full post surgery, due to re-suspension of the fat from her jowls back onto her cheeks. 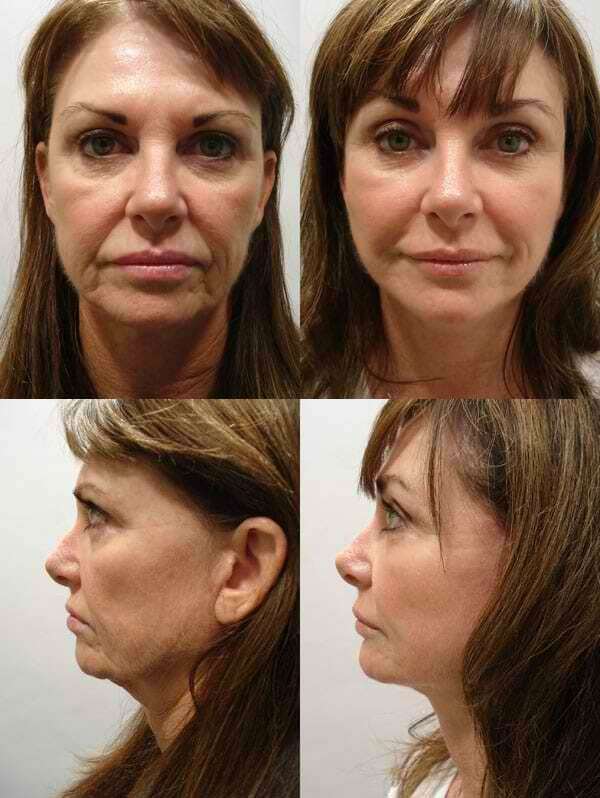 This patient was featured in People Magazine as one of the Top Facelifts in 2008. She underwent a facelift and neck lift, as well as surgery to her upper and lower eyelids. Overall, as you can see, she has an excellent outcome and she has maintained her result very nicely. This patient presented stating that she had done quite a bit of research prior to being evaluated by our practice for a face and neck lift. She wanted to have a very natural outcome and her primary fear was that she would look too pulled or tight. 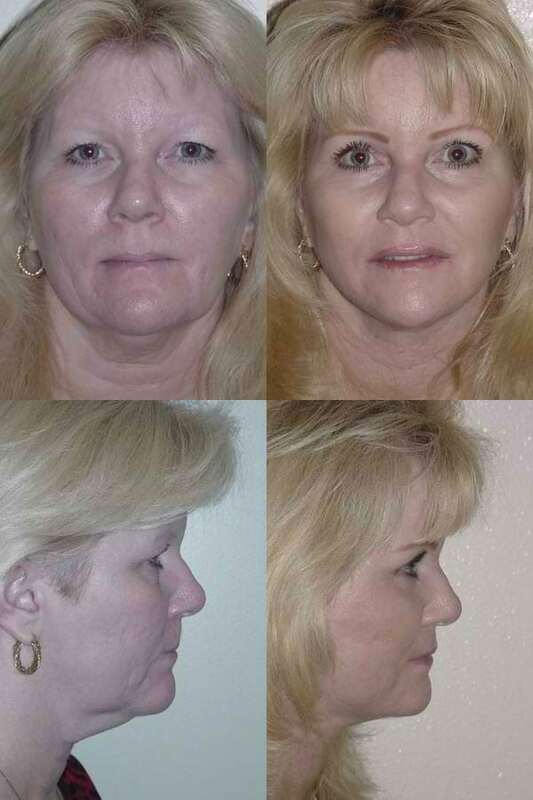 She underwent an endoscopic brow lift, as well as upper and lower lid blepharoplasties. We discussed the amount of extra skin in her lower eyelids and rather than taking skin out, we discussed performing, at a later date, some tightening of this skin with laser. My concern is always that if the patient has too much laxity of the lower eyelid or does not have sufficient cheekbone structure to support the lower eyelids, taking skin out will lead to the eyelid drooping over time. This post-operative photograph was taken approximately three months after surgery. Overall, she is very pleased with her outcome. As discussed, our plan is to tighten up the skin of her lower eyelids through chemical peels and laser treatments. This patient has a very heavy face, which made it a difficult facelift procedure. 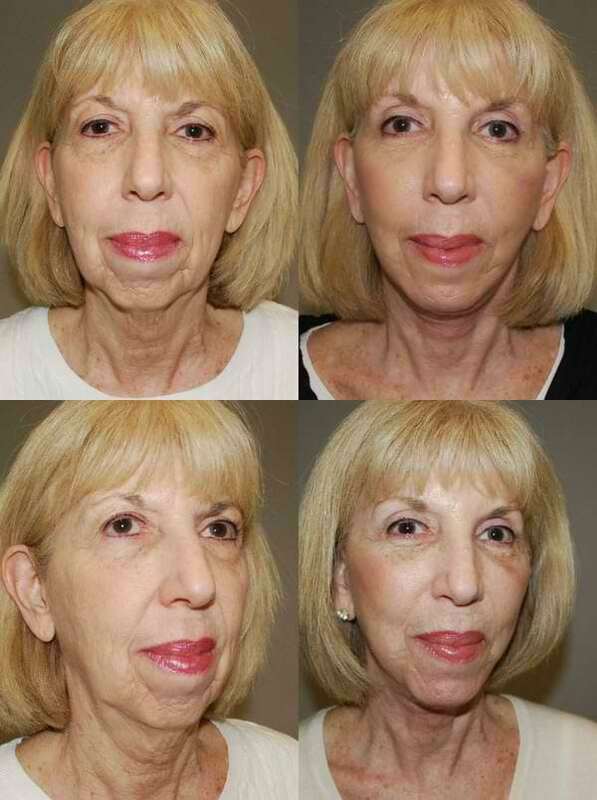 She underwent a face and neck lift, as well as lower lid blepharoplasty. At the same time, we did a lip lift to shorten the distance from the base of her nose to her lip. This photograph was taken approximately three months post-surgery, and, overall, you can see she has a very nice outcome. This patient came to San Diego from Beverly Hills to have her facelift and neck lift performed, as well as surgery to her brows and eyes. As you can see in this photograph, she appears approximately ten years younger after the procedures. She has nice jaw and neck lines and, overall, she is very happy with her outcome. She continues to refer patients to our practice, many years after her surgery. 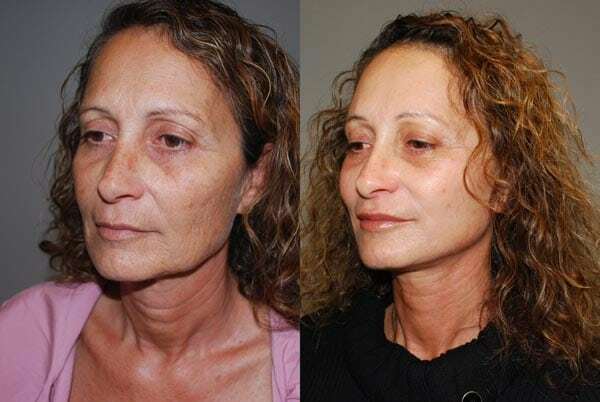 Prior to surgery, this patient had significant premature aging to her lower eyelids and mid-face area. 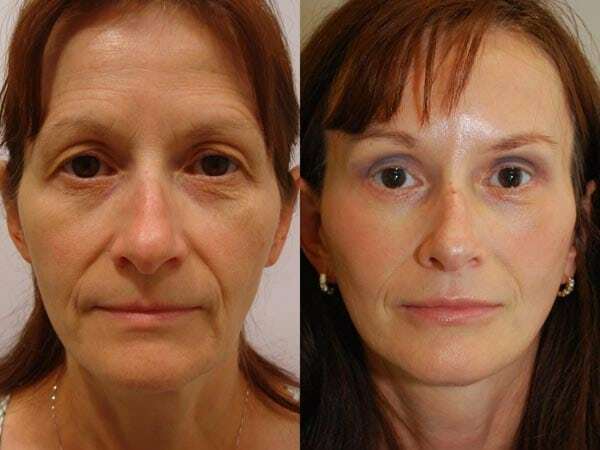 She underwent mid-facelift and lower lid blepharoplasty. Overall, you can see much nicer balance to her face. She is very happy with her outcome. 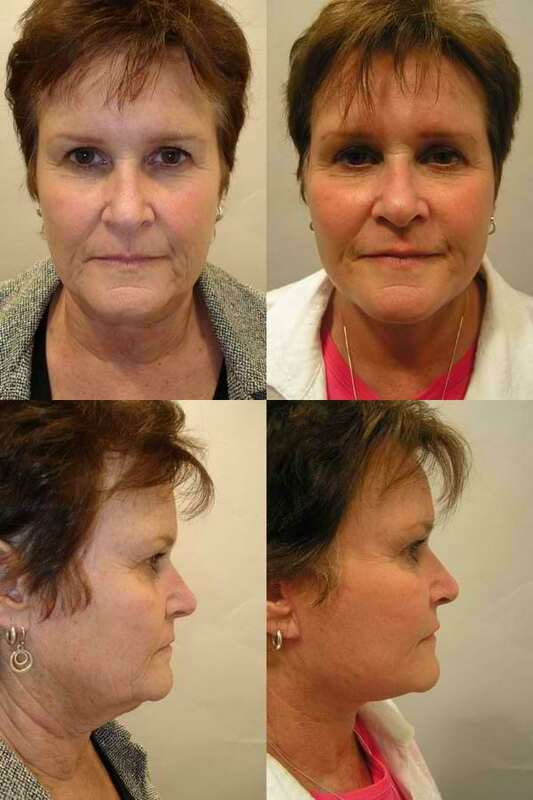 This patient underwent a mini-facelift and neck lift, just to tighten the jaw line and the area of her lower neck. Overall, you can see a very pleasing result and does not appear over-pulled or over-corrected. This patient also underwent an endoscopic brow lift and, as you can see in the post-operative photograph, her brows are higher than pre-operatively, but not pulled too tightly. Many patients often fear that their brows will be pulled too high or tightly and they will have a, “surprised” look, but as you can see, in most of the photographs of the patient’s in this section with endoscopic brow lifts do not appear surprised or over-pulled. This patient has significant facial asymmetry, pre-operatively. As you can see, post-operative, her symmetry is much better. 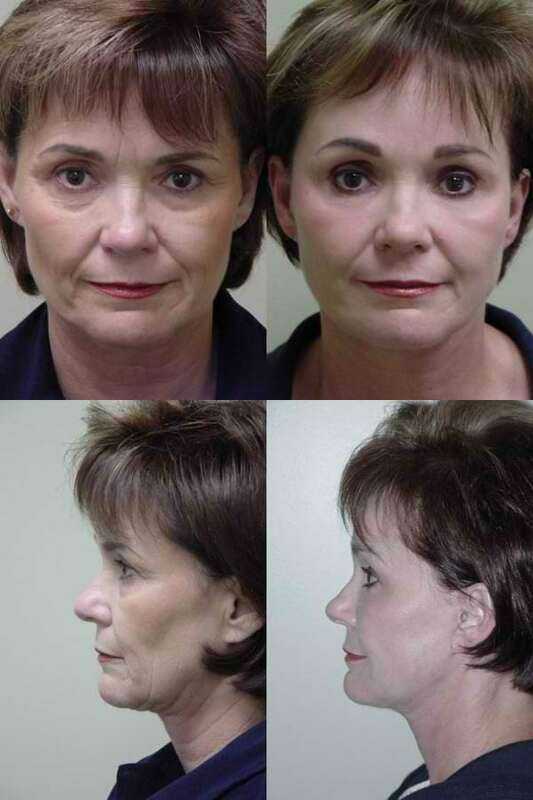 Overall, she has an excellent outcome after facelift and has been referring patients to our practice since her surgery. You will notice that we were able to fight some of the sun damage to her skin with a subsequent chemical peel. This patient is a very active woman who felt she appeared older than her true age. 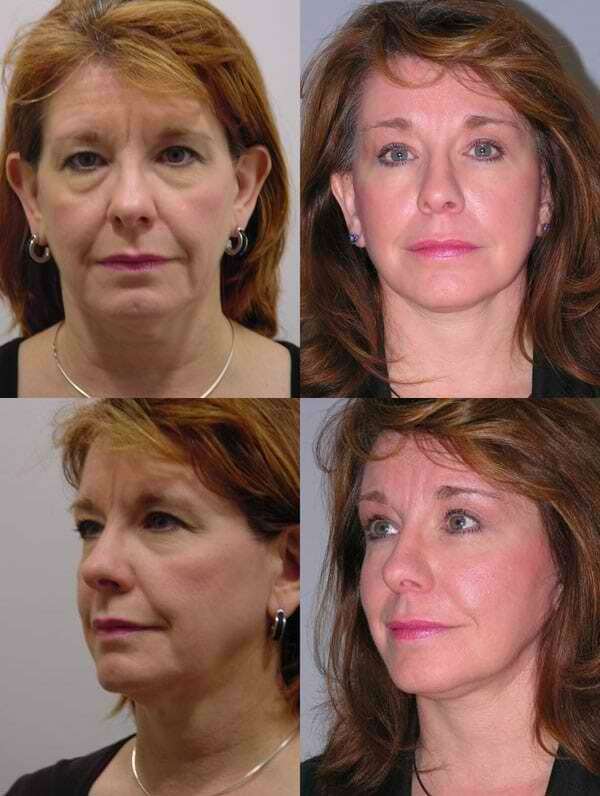 She underwent lower lid blepharoplasty, face and neck lift. This photograph was taken six months post-operatively. Overall, she has a very nice jaw line and the hollowness of her cheeks has improved with the procedure, as well as the noticeable bagging of her lower eyelids. This patient experienced a significant amount of weight loss and felt she appeared prematurely aged. 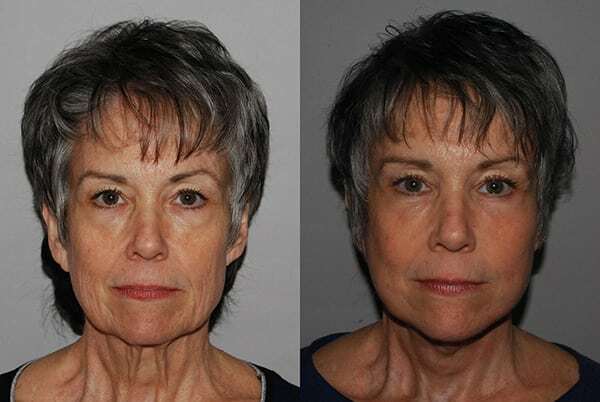 She underwent an endoscopic brow lift and upper and lower lid blepharoplasties, as well as neck and facelift procedures, she appears closer to her true age of 57 years. In this photograph taken approximately six months post-surgery, you can see she has an excellent outcome. This 68-year-old has significant facial aging and laxity to her skin. 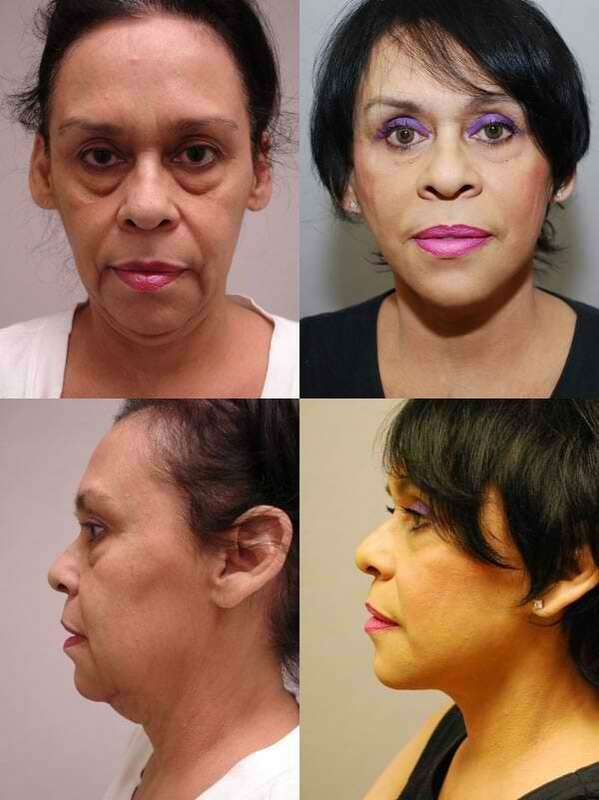 She underwent neck and facelift procedures, as well as endoscopic brow lifts. 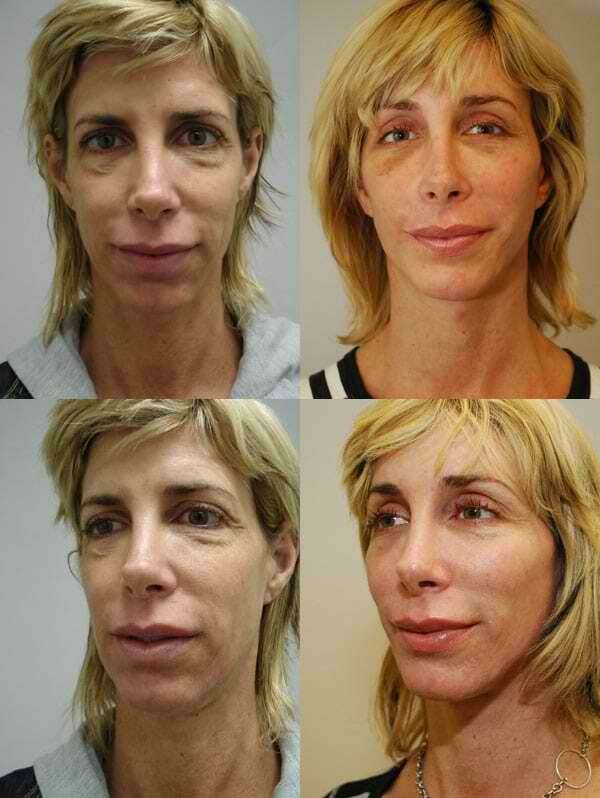 Overall, you can see she has an excellent outcome from the procedures. The profile view shows that her scars are not visible. This photograph was taken approximately one year post-surgery and you notice that she has maintained an excellent result. This otherwise healthy woman showed signs of premature aging, especially around her eye areas. 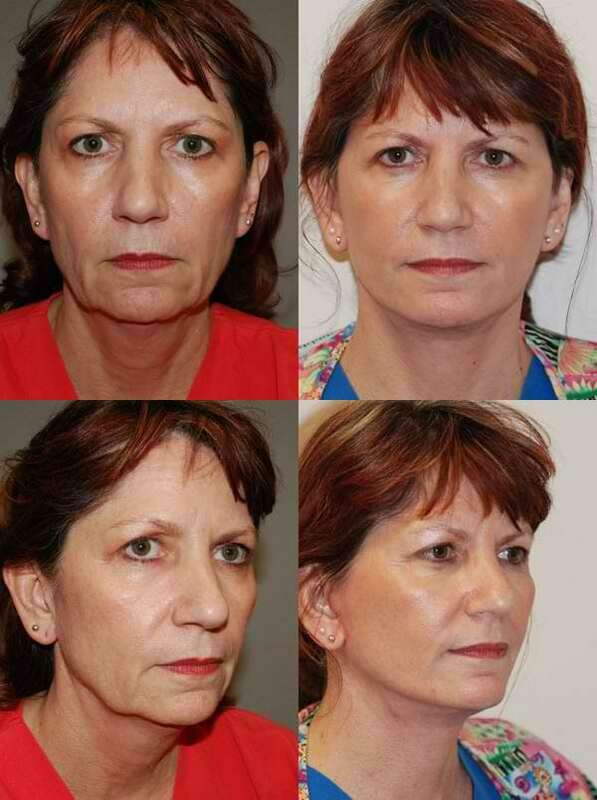 She underwent an endoscopic brow lift with upper and lower lid blepharoplasties, in addition to neck and facelift. We also added fat to her lips to provide better volume. This photograph was taken six weeks after surgery and she still appears slightly swollen, but, overall, has an excellent outcome. This patient desired a heart-shaped face, which she had in her younger years. 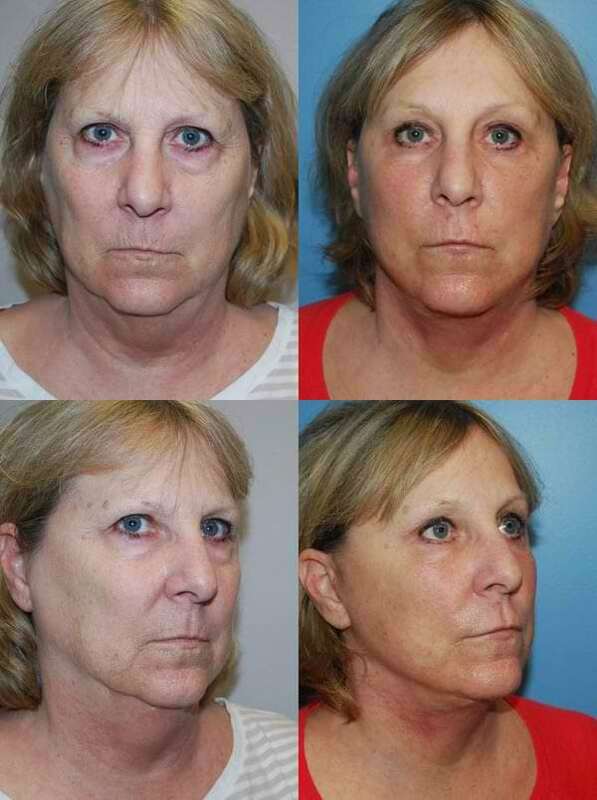 We performed an endoscopic brow lift, upper and lower lid blepharoplasties, as well as neck and facelift. Overall, you can see she has her heart-shaped face back and the contour of her neck and jaw line is much nicer, with much improved appearance and decrease of her jowls. 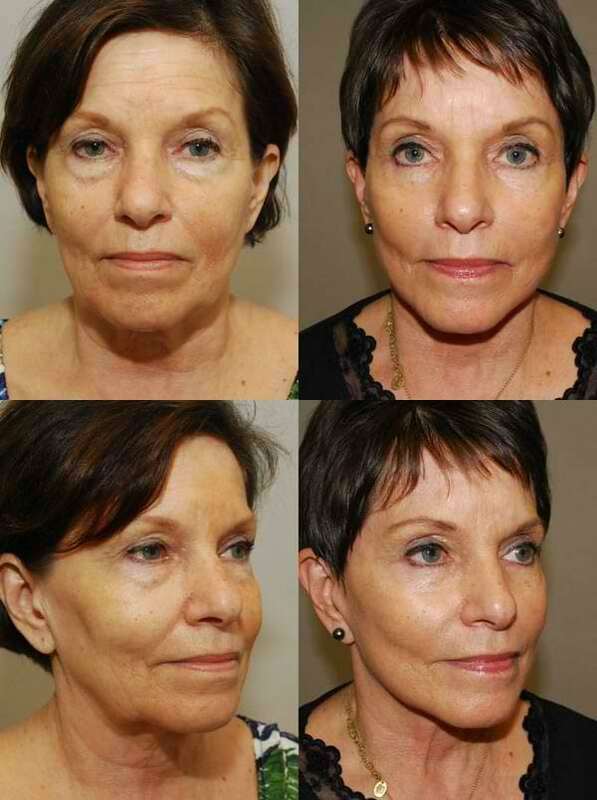 This patient came to San Diego from Alaska for her facelift, neck lift, and blepharoplasty procedures. This photograph was taken approximately three months post-surgery. As you can see, she just appears to be a younger version of herself. She returned to Alaska and is very happy with her outcome. This patient presented with major concerns with her neck and lower eyelids. 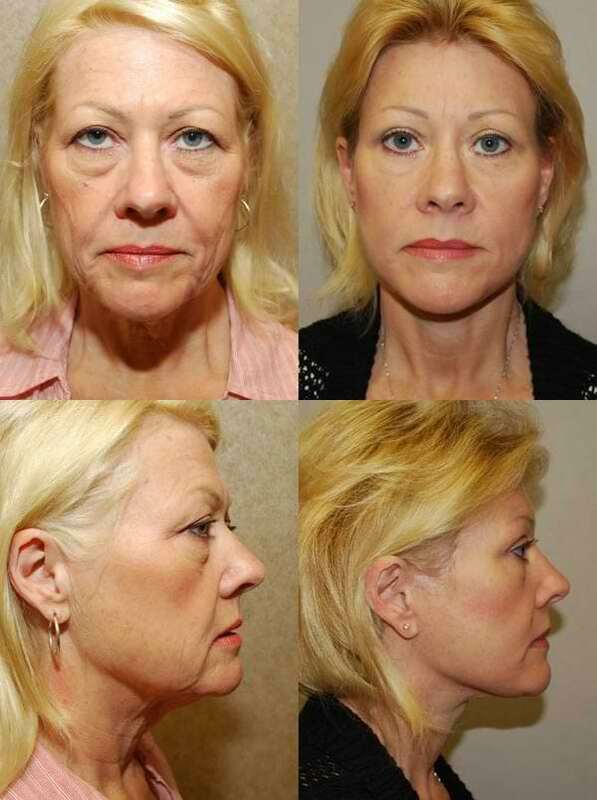 She underwent a lower lid blepharoplasty, as well as neck and facelift. It is clearly noticeable that her lower lids appear much nicer and less puffy. In addition, her neck and facelift have given her a nice, strong jaw line. This photograph was taken approximately three months after surgery. This patient has extensive sun damage, but also signs of deep facial aging. She underwent a neck and facelift, followed by chemical peel. This photograph was taken approximately six months post-surgery. 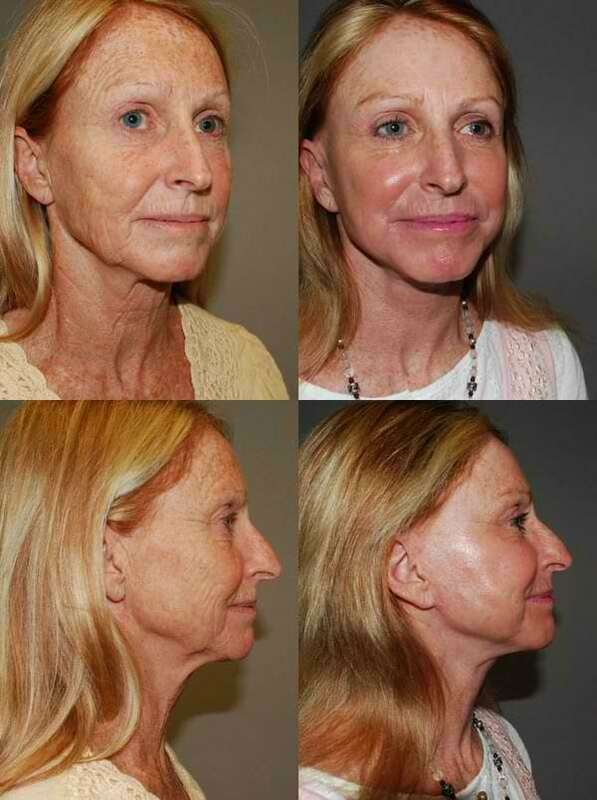 Cases such as this are extremely difficult due to the amount of sun damage, but starting with the deeper structures with a neck and facelift, followed by a chemical peel or laser treatment, provide the best outcome. 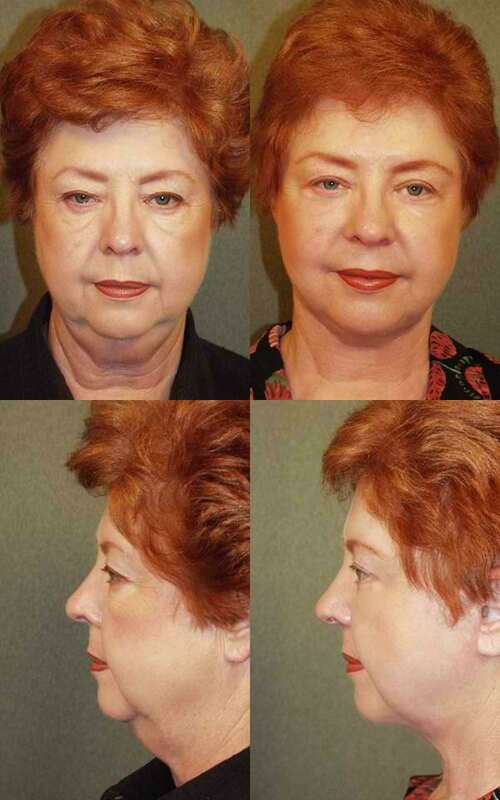 This patient wanted improvement in her lower face and neck. She underwent a mini-neck lift and facelift, which were performed in the office. Overall, you can see a very nice outcome. She is very happy with her result. This is a patient who underwent neck and facelift procedures, which was very difficult. Her face is very round and heavy. 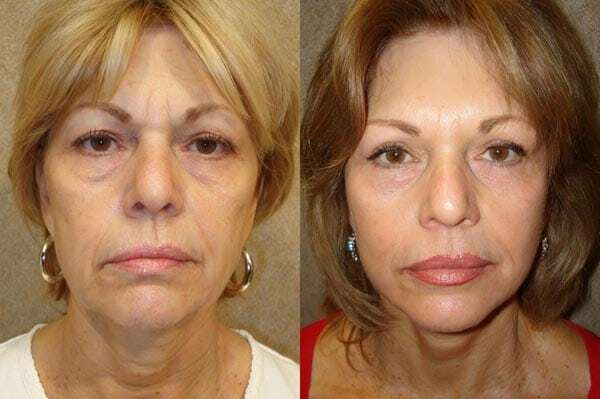 She underwent upper and lower lid blepharoplasties, followed by neck and facelift procedures. Overall, she has a nice outcome. Her after photograph was taken one year after surgery. She still has a full and round face and still appears approximately ten years younger. 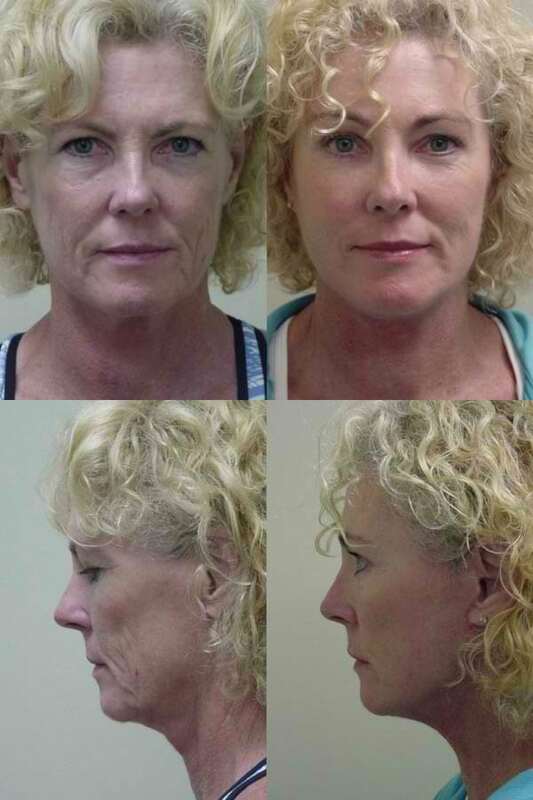 This patient came to San Diego from Los Angeles for an endoscopic brow lift and neck and facelift procedures. She is seen here posing for a photo shoot approximately one year after her surgery. She sent us this photograph as a follow-up result. Overall, she has maintained a very nice outcome and is very happy with her result. 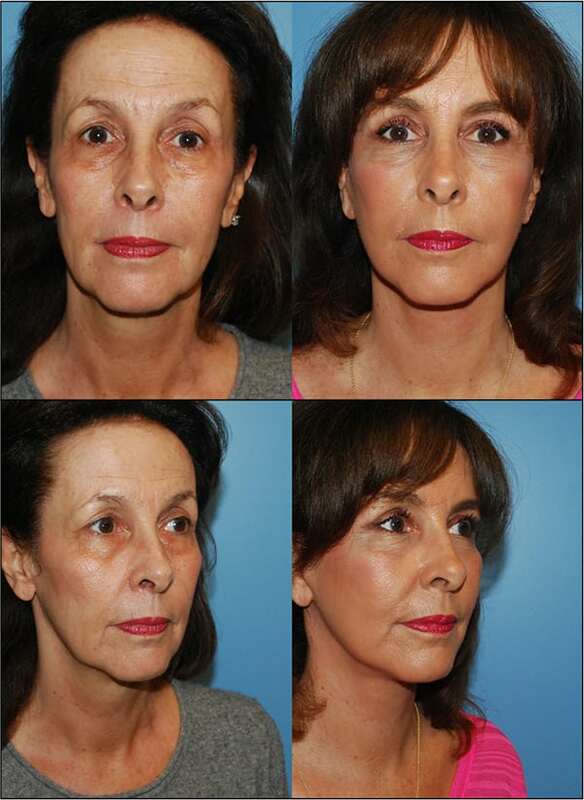 This patient underwent upper and lower lid blepharoplasty procedures, as well as neck and facelift. Once again, the goal for all of our patients is for them to appear as a younger version of themselves, without appearing over-corrected or over-tightened. As you can see, she has a nice jaw line and most of her wrinkles have improved. This patient desired to look better before her son’s wedding. She underwent a lower facelift and neck lift. Her jaw line and neck are appear much nicer. She is very happy with her outcome. This patient had a very difficult neck and facelift. To balance her lower face with her upper face, we opted to perform a chin augmentation. This photograph was taken six months after surgery and, as you can see, she has a much more pleasing outcome with the facelift and advancement of her chin. This, once again, was a difficult facelift and lower lid blepharoplasty. Six months after surgery you can see that the patient maintains a nice neck and jaw line, as well as very pleasing and natural look to her face. This 83-year-old patient, otherwise healthy, wanted to appear younger and healthier. 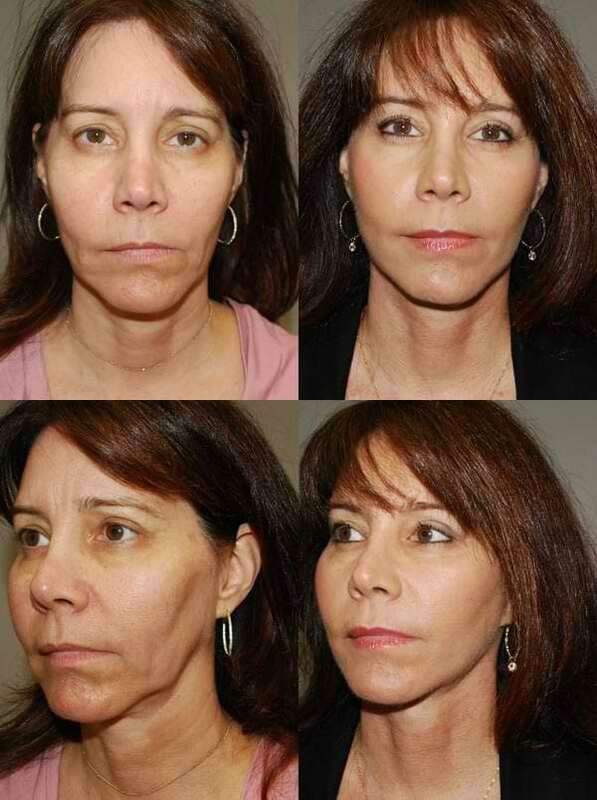 She underwent a lower lid blepharoplasty, as well as neck and facelift. Overall, she had much improvement in her neck and face. This photograph was taken three months after surgery. This patient has significant signs of sun damage. 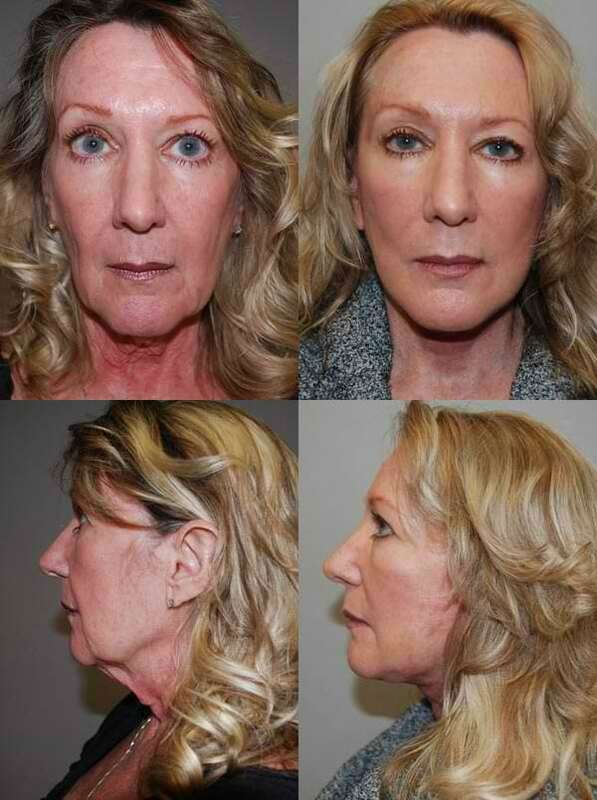 She underwent an endoscopic brow lift, as well as upper and lower lid blepharoplasty, neck, and facelift procedures. You can see that the volume of her face appears restored. Her brows to not appear too high, and she does not have a surprised look or over-corrected. After her surgery, she also underwent a chemical peel to fight the appearance of sun damage. Overall, she is very happy with her outcome. She continues to refer patients to our practice. 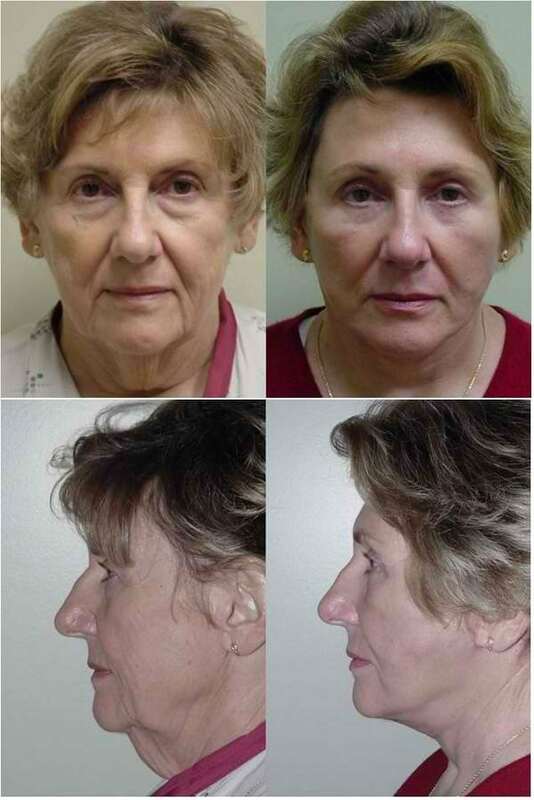 This patient underwent upper and lower lid blepharplasties, as well as neck and facelift procedures. Overall, she has a nice and pleasing result, without looking over-corrected or over-tight. This photograph was taken approximately six months after surgery. This patient underwent a mini-neck and facelift performed in the office. She has a nice and pleasing result. She is very happy with her outcome. This patient is of Israeli descent. She underwent a neck and facelift. In addition, she had a chemical peel to fight some of her sun damage. Overall, she has a very nice jaw line with decreased jowls. She is very happy with her outcome. This male patient wanted his ears to be pinned back, as well as to appear younger. 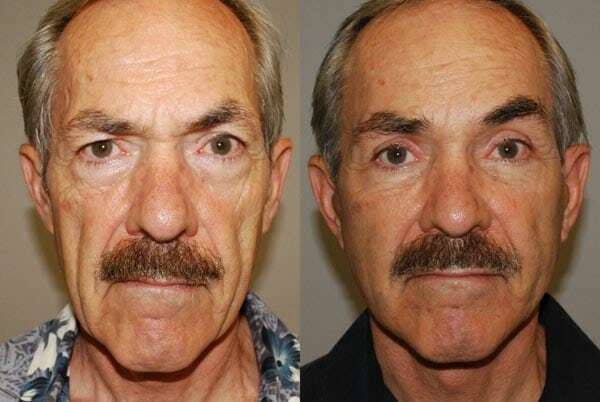 He underwent an endoscopic brow lift, neck and face lift, as well as pinning back of his ears. As you can see on the profile view, no scars are visible and are hidden nicely by his ear. He is very happy with his outcome. This 64-year-old male appeared older than his stated age. He underwent neck and facelift procedures. He has a very nice outcome. Specifically, in male patients, it is very important not to over-correct or feminize the face. As you can see, he had significant asymmetry, pre-operatively. There is still some asymmetry, post-operatively, but overall, he appears 15 years younger. 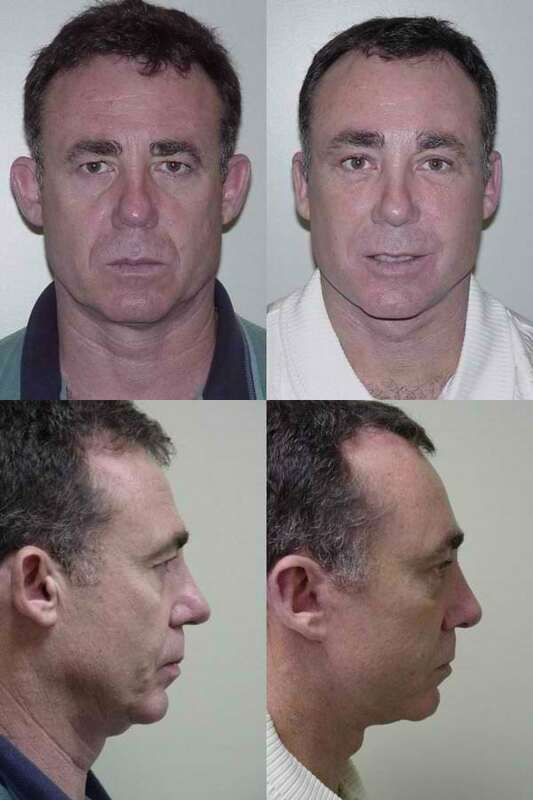 This male patient desired to have correction of surgery that was performed elsewhere on his lower eyelids, as well as to have neck and facelift procedures. His lower eyelids were sufficiently tightened, followed by a neck and facelift. Once again, he has a very nice outcome. He does not appear over-corrected or tightened. This 64-year-old patient was mostly concerned about all the excess skin in his neck and his jowls. He underwent a facelift and neck lift, as well as taking away the extra skin of his upper eyelids. This picture shows the patient approximately 3 months after surgery. His neck line is much improved and overall, he has a very natural appearance. His jowls are much better and he has a strong jaw line once again. This male patient wanted improvement in his neck and jaw line areas. He underwent neck and facelift procedures. Overall, you can see that three months post-operative, he has a very nice result. 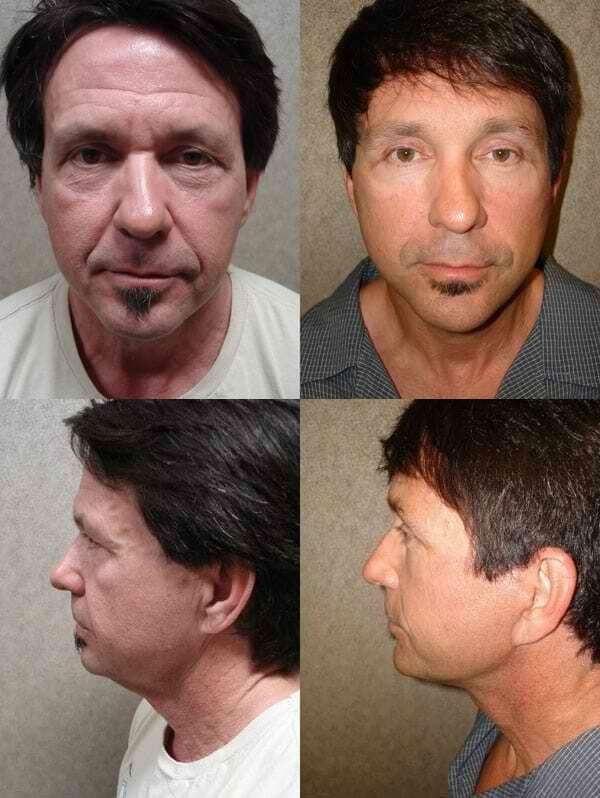 This 54-year-old male wanted improvement in his entire face. 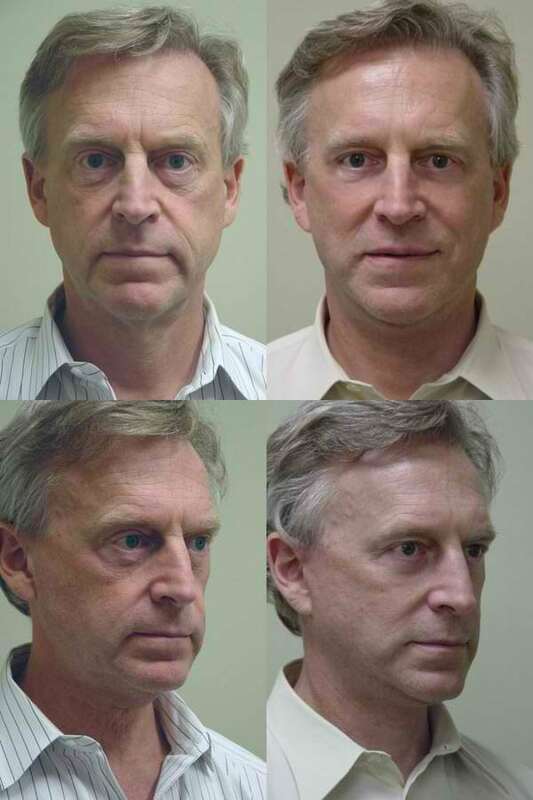 He underwent an endoscopic brow lift, upper and lower lid blepharoplasty procedures, as well as neck and facelift. This photograph was taken six months post-surgery and you can see that his scars have healed nicely. Overall, he has maintained a nice outcome. 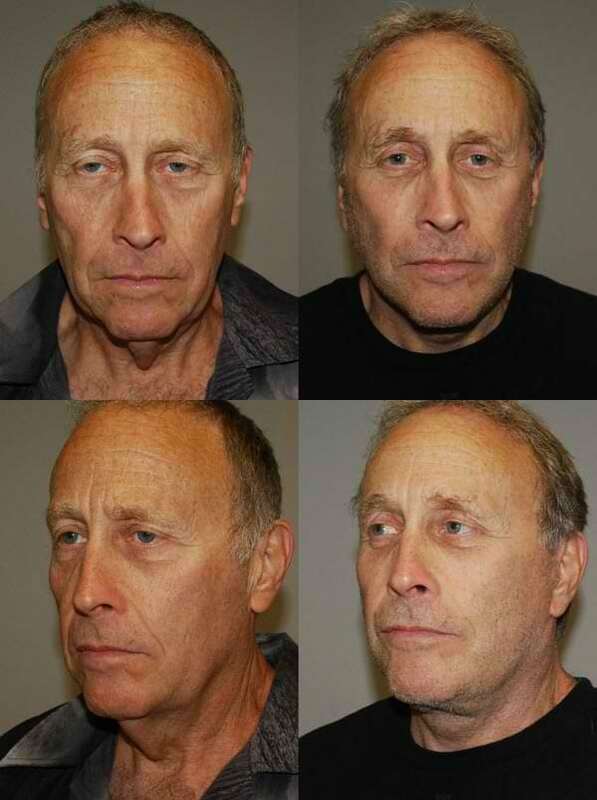 Patient presented with facial aging and wanted a rejuvenated look. Pre-operative photos are compared with photos taken 6 months post-operatively. 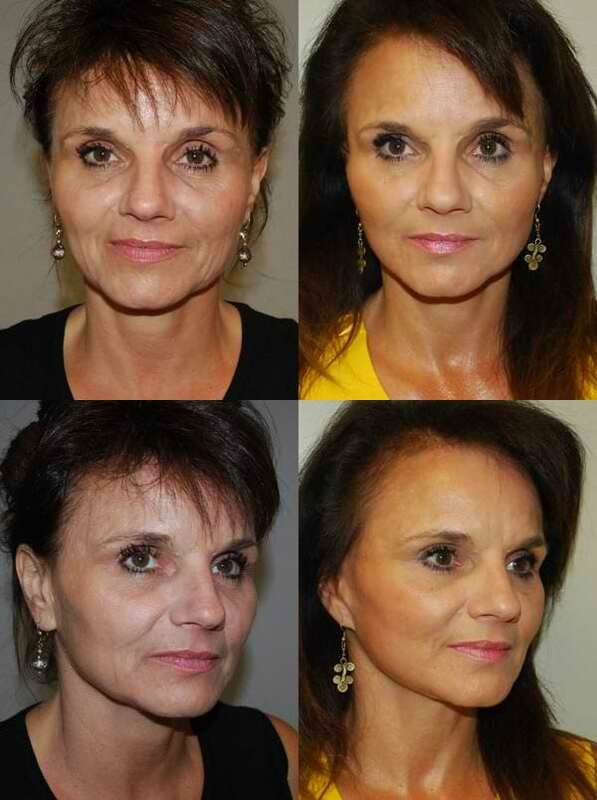 She is a 61 year old status post-op for a face lift, neck lift, and a lower eye lid blepharoplasty. Patient has healed well and is very satisfied with her results. 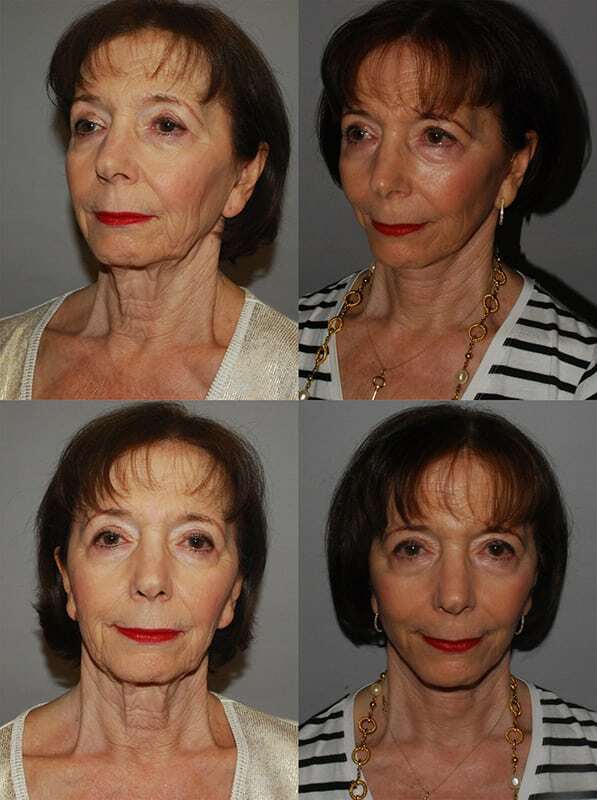 This is 76 year old former patient who returned desiring a face and neck lift. Pre-operative photos are compared with photos taken 10 months post-operatively.